What goes with a sad salad? A sad-wich, of course. France has all the raw building blocks of a Dagwood extraordinaire: excellent bread, charcuterie (cured meats), cheeses, vegetables, fancy mustards. Yet what do the French serve as sandwiches? Baguette with Emmental, ham, and butter. Or worse yet: baguette with butter and Camembert. And don't even get me started on the ubiquitous American foot-long hot dog option. With a few exceptions (and we praise them, mightily), nearly every French boulangerie and grocery store that makes and/or sells sandwiches makes the same half-dozen varieties. In addition to the two sandwiches above, you can generally get salami, Emmental, and cheese; chicken, Emmental, and mayonnaise -- possibly with lettuce and tomato; sometimes tuna salad with lettuce and tomato; more rarely chicken salad with lettuce and tomato; occasionally Mozarella and tomato; and maybe, if you're lucky, Brie or Chèvre options. There is so little creativity, or use of the available ingredients, it's just a crying shame. It's one of the few areas where we feel that America in general -- and especially a foodie spot like the Bay Area or NYC or LA -- does it much, much better. Where are the sprouts? The roasted veggies? The flavored sauces, spreads, and condiments? Le sandwich is dead. Long live the sandwich. I have a feeling that Alain Hess is my kind of guy. He's a cheesemaker who loves creativity and originality and keeps searching for interesting iteratations of his artisanal cheeses. One of these -- the original and still best-selling of his creations invented around a dozen years ago -- is Délice de Pommard. 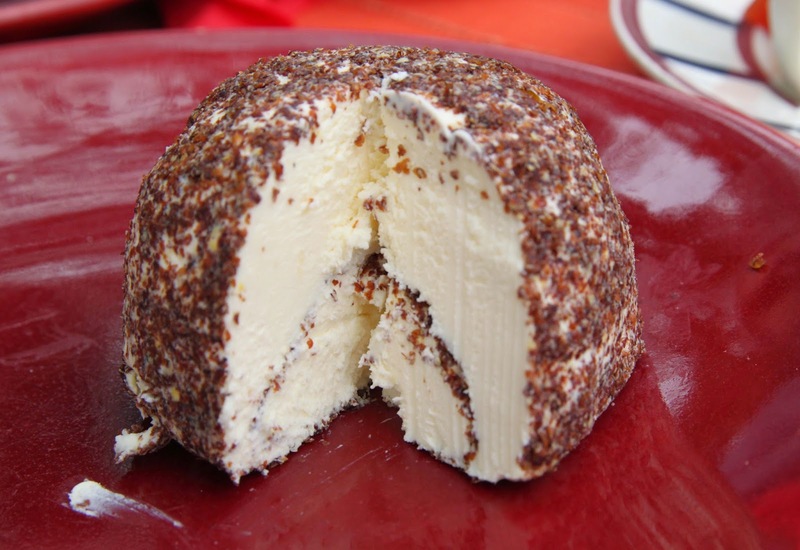 It's a creamy ball of triple cream pasteurized cow's milk cheese ribboned and coated with layers of stoneground mustard from Beaune. And it's even exported to Europe, the US, Canada, and Japan. Following the success of this creation, Mr. Hess has apparently made other variations, including Burgundy black current, Dijon spice cake, Italian summer black truffles, and more. There are mini-balls, aperitif-style with mustard, garlic and herbs, or nuts. On Valentine's Day each year, he even makes a version with rose petals. We try the original version, and I like it immediately. Some of my French friends aren't so sure, though; I suspect to them it tastes too mustardy, not cheesy-enough, and just too strange. But even Pippa, who doesn't normally like mustard, enjoys the cheese -- possibly not identifying it with the condiment. It's true that it doesn't taste a thing like, ironically, French's yellow mustard (which is not French, and, in my mind, is barely mustard). The mustard gives more of a tang to this cheese, and even a kind of sweetness, as opposed to the spiciness Pippa might have expected if I'd told her what she was eating. This cheese is a particularly great choice for a sandwich, given that it's creamy and has a tangy, authentic mustardy flavor built right in. 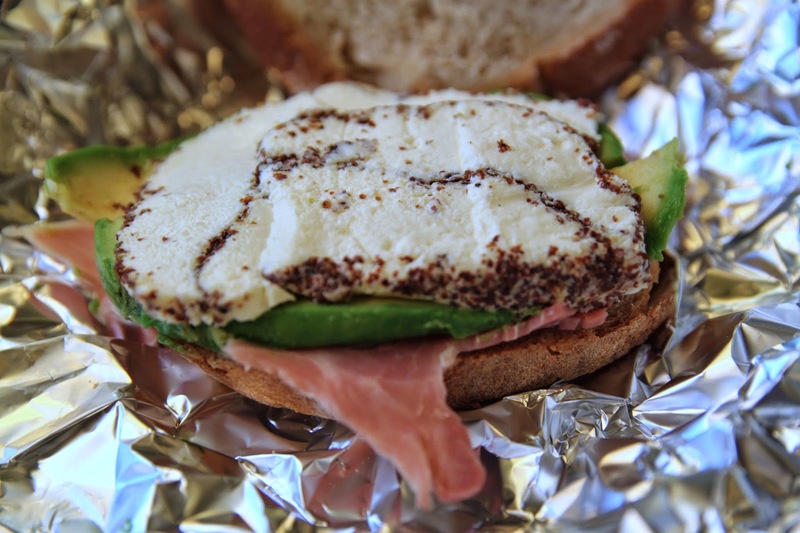 It's fabulous on this homemade sandwich, which I make and bring for a train picnic. This is just a simple sandwich, mind you, because our supplies are limited at the time, but even then, with slabs of good ham and avocado and the Délice de Pommard, I manage to come up with something that is both delicious and different.